Assassin's Creed IV: Black Flag played the shark card last week and you all called its bluff in the 'Shop Contest. Today we have two dozen finalists compiled, including three double-finishers, plus SteveFish, a first-timer at overall number one! Gang, it is no secret the 'Shop Contest has been through a challenging year, thanks to format changes and other problems here. But when it can kick out two dozen gutbusters on a run-of-the-mill exploitable like ACIV's latest pack of screenshots, I feel like it's back at fighting weight. For some of the more subtle ones, I absolutely howled at the efforts of EllieRyan (5), ForeverWhatever (6) and all the others who put the shark in Ezio/Altaïr's hood. Recently published author sciteach (17 and 18) made two great obscure pop culture references that likewise had me chortling. Pirika (16) uses the same goddamn toothbrush I do, and that made him so , so close to an overal No. 1. I wish my teeth were that white. MicBeezy's appropriation of Jabberjaw (13) the Hanna-Barbera shark, was just ... I'm wiping a tear right now. JussAren (10) fought his way out of gray-land with an homage to one of the worst movies I or my friends ever paid money to see in the theater. Kanzler666 (11), also got a battlefield promotion from the grays, doing it all up like another Ubisoft title, Far Cry 3: Blood Dragon. 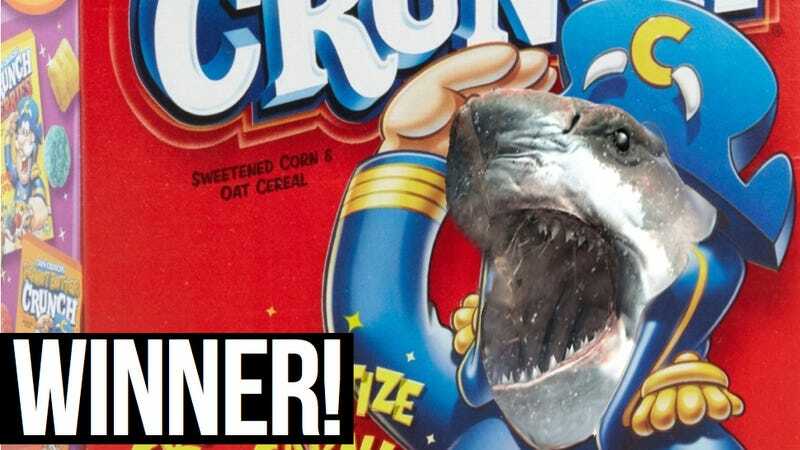 Despite Billysan's stripped-to-the-waist Batman whipping out the shark repellent (4), and Orionsangel's (15) and ONoelson's (14) fabulously timely references to Phil Fish, SteveFish's cereal box cover (19) is just pants-shittingly funny. The toothy, crisp salute puts me on the floor every time. So I offer all of you a crisp salute in return—just don't soil your own britches. See you back here tomorrow.